When an individual becomes a Christians it is assumed that they have accepted Jesus as Savior, that is, they have acknowledged that Jesus Christ came from the Father, was born of a virgin, lived a sinless life, was sacrificed for our sins, was resurrected, and now sits at the right hand of God intervening for them; but do they know Him as Lord? Every new Christian should understand the concept of the Savior when they come to Christ and this is the first part of the salvation experience. What most people fail to understand is the second part of the salvation experience, which is that Jesus Christ needs to also become the Lord of their life. Yes, there is a difference between being Savior and being Lord. In the Bible you will find the word lord either spelled with all capital letters, LORD, or as “Lord”. The first version, LORD, stands for the name of God Himself, which is the Hebrew translation of the word YHWH (Yahweh). A titled nobleman; a person whose ordinary term contains by courtesy the title Lord because of the position they have attained. Therefore, someone whom you call Lord is in a position of authority, power, control, and deserves your respect and obedience. You acknowledge their authority and your submission to their authority implies your willingness to obey their commands. 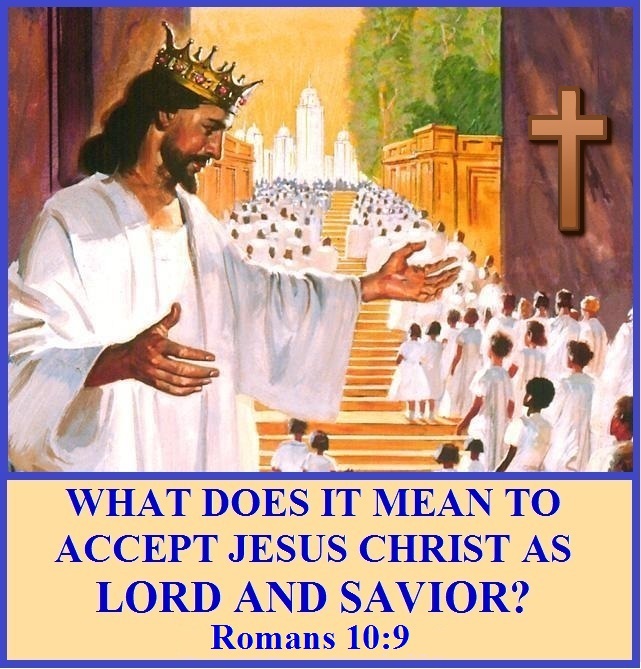 The point is that when a person accepts Jesus as Lord and Savior they should not only accept Jesus in the position of Savior but also as Lord. Jesus said in John 14:15, “If you love me, you will obey what I command.” Only a person in a position of authority has the right to command and Jesus has that authority, granted by the Father (John 3:35, Ephesians 1:22). The only thing required of us, for Jesus to be our Savior, is for us to believe. On the other hand, for Jesus to be our Lord we no longer make our own decisions, He makes them for us. When He is the Lord of our life, He is in total control, and we follow His instructions without questioning and in doing so placed ourselves under His Lordship and His authority. Jesus has the right to command us and to expect that His commands will be obeyed. Jesus does not want us to call Him “Lord” and “Master” if we are not willing to commit to doing the things He says as He told His followers, “But why do you call Me, ‘Lord, Lord,’ and do not do what I say?” (Luke 6:46). Our deeds need to match our words: “And whatever you do in word or deed, do all in the name of the Lord Jesus, giving thanks through Him to God the Father” (Colossians 3:17). To confess Jesus’ Lordship with our mouths while not submitting our lives to Him is empty talk. If He truly is our Lord, then He controls both our words as well as our deeds. Now that you are aware of what it means to know Jesus as Lord and not only as Savior does this change anything for you? Will Jesus truly be your Master, God and Sovereign Lord over every goal, purpose and decision in your life? Will you be obedient and sensitive to His requirements now that you are aware of the implications of Jesus as Lord? Or will you continue to accept Him as Savior but can’t see letting this Lordship interfere with your life? Remember that if you place Jesus in His deserving place as Lord of your life, you might have to change some things, like give up a bad habit, reprioritize your life, and stop being self-centered. Accepting Jesus’ Lordship involves saying “yes” to whatever He says. It involves denial of self-interests, including sometimes the giving up of life itself – but it also involves finding life; that is, eternal life. Jesus told His disciples: “Whoever desires to come after Me, let him deny himself, and take up his cross, and follow Me. 35 For whoever desires to save his life will lose it, but whoever loses his life for My sake and the gospel’s will save it. 36 For what will it profit a man if he gains the whole world, and loses his own soul? (Mark 8:34-36). In these verses Jesus is commanding and demanding absolute obedience and surrender to His eternal Lordship, over everything that we desire, say, think and do. Here Jesus has defined the aspect of true Christianity; anything short of total commitment to the Master is foolish religiosity and hypocrisy. When you come to Christ and are truly saved, the Spirit of God will move on your spirit and you will acknowledge Jesus as your Savior and make Him the Lord of your life. It means that: “I have been crucified with Christ; it is no longer I who live, but Christ lives in me; and the life which I now live in the flesh I live by faith in the Son of God, who loved me and gave Himself for me” (Galatians 2:20). Please remember that it is not enough to have head knowledge of who Jesus is or to just say you believe. If you have claimed that Jesus is important in your life, start showing it by your actions. Being a Christian means becoming transformed into Christ’s image, not molding Him into the image you think is right and rightfully making Him the Lord of your life. How much we live our lives in obedience to God is an indication of how much we have submitted our lives to the lordship of Christ. You are so right Victor! Thanks for your comments. Blessings.